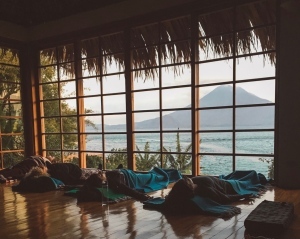 I just returned home from leading a 7 -day retreat at Lake Atitlán, Guatemala and I notice that my capacity for the busyness that is going on around me has diminished. I find myself overwhelmed by even the simple act of driving my car to the grocery store and shopping for food. What happens when we go on retreat and how do we return back to our daily life? Depending upon the type of retreat you go on, your days were probably filled with hours of meditation, yoga practice and quiet restful periods where you were removed from the usual tasks that fill up your days. Sounds heavenly’ right? Well, it is. Retreats offer us the opportunity to slow our days down so that the quality of our attention can focus more on being rather than doing. We get the chance to re-organize how we spend our time. We unplug. Not just from our technological devices but also from the daily habits that may or may not be healthy for us. On retreat, our bodies re-adjust to new schedules and new ways of doing things. We eat healthier, sleep better and exercise more. New friends, new experiences and new insights inspire us. So after all of this, how do we come back home and return to our responsibilities? Your transition back home begins when you are on the retreat. If you can plant the seeds for your life after retreat while you are on the retreat, the chances of maintaining what you learned and experienced on the retreat will be more successful. Setting clear intentions to adopt different and healthier behaviors at home while you are in the supportive environment of the retreat is so important. If possible, organize your schedule so that you have some days off at home before you have to return to work. This will give you time to re-integrate slowly. If you were out of the country, you may need some space to re-adjust to a time difference. You can also use the days off to process what you gained from your retreat experience. This off time can also be a great way of supporting your commitment to the healthy new behaviors you experienced on retreat; clearing your pantry of old foods and shopping for new healthier foods is a good way of continuing your retreat habits at home. Setting up a new meditation space at home can help support the continuation of daily meditation practice. The first 3 days can be disorienting, so allow yourself time to settle back in slowly - even with social activities. Keeping your calendar simple and un-busy is a good idea as you re-adjust back home. I say compassionately commit because changing habits is hard. You can use your time away on retreat to learn more about your patterns and when you return back home begin to make small adjustments in the areas of your life you would like to change. But remember to do this with kindness. Even adding in one small practice to your back home life can help you maintain your retreat. You probably did not have family go with you on your retreat. They stayed back home and tended to the things that you stepped away from. It is a good idea to gently remind yourself of this as you transition back home. They did not have the experiences you did and they will most likely feel a little outside of your new sense of self. It may be necessary to also remind them that you have been away and that you may need a little more quiet time the first few days. Helping your family understand this even before you go on retreat can be supportive. Also, it is good to remember to thank your family for their support. They may have been taking care of the pets, the house, and other tasks while you were away. Sharing your gratitude for them can help ease your transition back into your responsibilities. They may even offer to continue taking over those tasks for the first few days of your return to allow you more time to come back. Sharing your experiences from the retreat and your new insights about what you want to change in your life can be tricky with members of your family as they may not share those same desires. Be mindful of how to introduce these new ideas into the family household. Getting everyone on board in a kind and inspiring way has a better chance of success. If you do not already have a community around you that supports what you were engaged in on your retreat, healthy diet and lifestyle, yoga and meditation, now is a really good time to find that. Look for a yoga studio or meditation hall where you can take classes to continue your practice. Being around others who have the same healthy interests that you now do can strengthen your commitment to this new way of being. It is a great idea to schedule another retreat for yourself in 6 months to a year while you are still basking in the energy of the current retreat. This will help support you when some months have passed and you find yourself losing the inspiration to keep up your good habits. People who are successful at maintaining their yoga, diet, and meditation practices are those who take the time to refresh their healthy habits every six months or year with some type of immersive time away to practice. Planning your year with an annual retreat is a good way to strengthen your life journey for years to come. These are just a few ideas to support your return back home. The gift of retreat is the opportunity to step outside our normal routines and to spend some quality time focusing on you. Remember when you are filled up, inspired and re-charged, you have more to give. As I settle back into my daily life back at home, I can sense what I gained from my time in Guatemala in the smallest of ways. I am still moving a little slower and more mindfully and my appreciation for my practice has deepened. take a deep Bow of gratitude for the life that I have right here. Join Erika in Maui October 5 - 10th, 2019 and in The Sacred Valley of Peru April 5 - 14th, 2020!